The Caulfield carnival continues on Wednesday and Ballymore heads to the 1000 Guineas meeting with three runners - Savvy Dancer, Rhythm To Spare and Crimson Lady. Back in Melbourne after running a couple of very good races in Adelaide, Savvy Dnacer will be partnered by James McDonald in the second event of the day, the BMW Handicap. A Morphettville winner two starts back and third at that same track last time out, Savvy Dancer has, says Michael Moroney "had a bit of racing, but he seems to have trained on well so we are hopeful." "He has been racing in good form and this looks the right sort of grade race for him." At his best on race day over staying trips, Savvy Dancer is described by Moroney as "a tricky horse." "He wants ground but he works like a sprinter!" 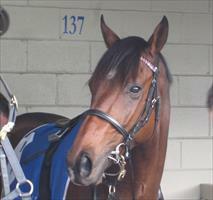 "He had a jump-out here at Flemington last week," Moroney reported, "and he went terrific." "He has a tricky draw (12) to contend with but Glen Boss sticks with him and he is riding so well." Crimson Lady was luckless when resuming and hopefully she can atone in the Group 3 Classic, the seventh event on the card. Needing to weave her way through the field after settling back on the rails at Caulfield late last month, the five-year-old was baulked in the home straight and could've finished even closer up. Fifth beaten less than 1 1/2 lengths that day, Crimson Lady has pleased us since but we are wary of her "mixed form" last time in. "We really want to see her run two good races in a row," Moroney said, also expressing concern over her barrier draw (14). The daughter of Volksraad has however shown plenty of ability and can hopefully race up to her best on Wednesday. In other stable news Caulfield Guineas runner Marwood heads to the paddock for a spell, Moroney confident that the lightly raced three-year-old will be all the better in the autumn.